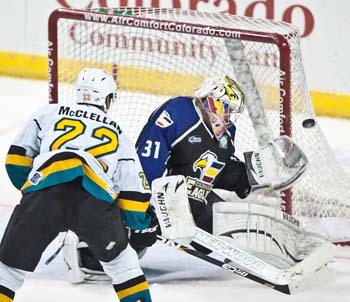 LOVELAND, Colo. – In the 500th regular season game in franchise history, the Colorado Eagles defeated the Rio Grande Valley Killer Bees, 5-4. The win put Colorado in sole possession of first place in the Turner Conference and made their all-time record against the Bees (who entered the league in the same season) 10-1-0. All-time, the Eagles are 334-125-41 through 500 games (a .707 winning percentage). Andrew Penner, seeing his first action since Feb. 15, was named the game’s No. 1 Star as he made 31 saves — several at key moments in the game. The Eagles and Bees played a fast and furious first period. Despite Rio Grande Valley having a 16-10 edge in shots, it was Colorado that won most of the battles for loose pucks. However, despite the Eagles jumping out to a quick 2-0 lead, the Bees kept battling back by capitalizing on Colorado turnovers. Colorado got the game’s first goal just 41 seconds in when Riley Nelson found Kyle Peto in the high slot for a snap-shot past Jerad Kaufmann. And less than a minute later, Andrej Hebar sped his way around a clutching defender before one-arming a pass back to Alex Penner for a one-timer from the high slot. At 7:50, the Eagles nearly went up 3-0 when Joe Grimaldi’s point shot trickled through Kaufmann and stopped on the goal line before completely crossing. Four minutes later, the Bees cut Colorado’s lead in half when Tyler Lehrke stole the puck to the right of the Eagles goalie and sent a pass across the lip of the crease to Tomas Klempa. And at 17:03, Bo Cheesman tied the game at 2 for Rio Grande Valley with a bad-angle shot from the right side of the net. Colorado went back on top at 18:30 of the first frame after Alex Penner carried the puck around the net and back up the right wing before dropping a pass to Kip Workman for a one-timer that made it past the Bees’ netminder. But just 24 seconds later, Kyle Radke answered with a shot from the left circle after Andrew Penner had been knocked down and couldn’t get up and set in time to defend it. That goal sent the teams into the first intermission tied at 3. The second stanza was much tamer, with the Eagles getting both of the goals in the period. Scott May put the Eagles back on top at 6:38 by intercepting a pass and quickly beating Kaufmann’s glove with a great shot from the right circle. Adam Chorneyko made it 5-3 at 14:28 when he entered the offensive zone along the right wing and beat the Bees’ goalie with a low shot inside the far post from the faceoff circle. Colorado gave the home crowd another reason to get on their feet with a big penalty kill late in the frame. The Eagles continued their strong penalty killing in the third period, stopping an abbreviated 5-on-3 for the Bees midway through the final session. But at 11:43, Cheesman set up Zak McClellan for a goal from the side of the net to cut Colorado’s lead down to 5-4. The Eagles, though, held strong from then on, thwarting a sturdy final push from Rio Grande Valley. The two teams will meet again Saturday night at the Budweiser Events Center.